The workshop will bring together researchers working in the broad field of modern dynamic macroeconomics, to discuss research papers and agendas. It is primarily addressed to Italian researchers and to researchers connected with Italian institutions. Contributions from Ph.D. students in their final year and from junior researchers are particularly welcome. For further details, please see the Program. 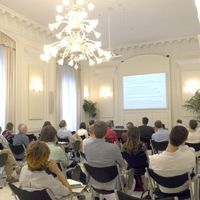 Organized by the Associazione Carlo Giannini (ACG) and hosted by EIEF, the meeting aims to bring together young researchers in applied and theoretical econometrics and introduce them to the Italian econometric profession. The selected researchers will present a paper in the meeting. Each paper will be discussed by a discussant. 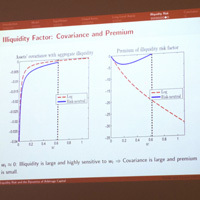 The discussants will be chosen by the Associazione Carlo Giannini board among leading econometric scholars in order to provide effective and useful feedbacks to the presenters. For further details, please see the Program. The European Winter Meeting of the Econometric Society aims to promote the quality of the work done by young European researchers in economics and econometrics and to provide a better platform for the top European PhD’s candidates in the international job market. Participants will have the opportunity to interact with the best European colleagues from their academic age cohort and with a group of senior academics representing different European regions and fields of specialization. EIEF will host the fifty-second panel meeting of the Economic Policy journal on October 22-23, 2010. At the meeting, papers commissioned for the journal, will be discussed by the members of the Economic Policy Panel. For further details, please see the Program. The goal of this two-day workshop is to cover a wide range of current issues in macroeconomic theory and policy. The workshop will provide an ideal venue for those interested in presenting preliminary ideas and receiving comments from an eclectic group of researchers. We’re aiming to have an open environment where new ideas could be freely exchanged. Organizers: Gabriel Lee (IHS and Regensburg), David Andolfatto (SFU and FRB St. Louis), Martin Gervais (Southampton, IFS) and Francesco Lippi (EIEF and Sassari). For further details, please see the Program. EIEF is hosting the conference on “The Future of Monetary Policy” organized together with the Banca D’Italia and the Banque de France. Papers and Presentations. The conference seeks to bring together first-rate current research on “Transparency, Disclosure and Market Discipline in Banking Regulation” building on the experience of the recent crisis. For further details, please see the Program. 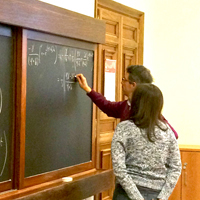 This annual workshop, which started in 2001 as the Villa Mondragone Workshop in Economic Theory and Econometrics, is designed to stimulate the interaction between senior economists and doctoral students working on both theoretical and empirical economic issues, and well ahead in their dissertation. 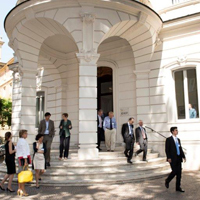 The workshop is the result of the cooperation between five Italian research institutions – the Bank of Italy, Bocconi University, Collegio Carlo Alberto, EIEF, and LUISS – that are present on the international academic job market for economists. Additional financial support was provided by the Journal of Applied Econometrics and by LABOUR: Review of Labour Economics and Industrial Relations. For details, please see the Program. ERWIT is an annual workshop that brings together international economists from across Europe and key researchers from outside the region. The workshop disseminates the findings of recent research on international trade, and presentations often involve exploratory rather than finished papers. It provides a unique opportunity to discuss trade-related research in a relaxed atmosphere. Another important aim of ERWIT is to provide young researchers with the opportunity to meet and discuss their work with senior economists. For details, please see the Program.